Although we made this ice cream on a different day than the apricot-cherry crisp post, we used it for another crisp a couple of weeks later. This recipe is based on an article I found in the San Francisco Chronicle many years ago with a custard recipe and has always worked flawlessly. In this case I used vanilla seeds from a bean for the flavoring and Strauss milk and cream for the base. Not a cheap recipe but worth the cost for special occasions. This thing gets a fair amount of use during the summer. 1. This should be done over a couple of days to properly cool the ingredients as necessary. 2. Once all of the ingredients are combined, you'll need to constantly stir the custard anywhere from 5-15 minutes. 3. 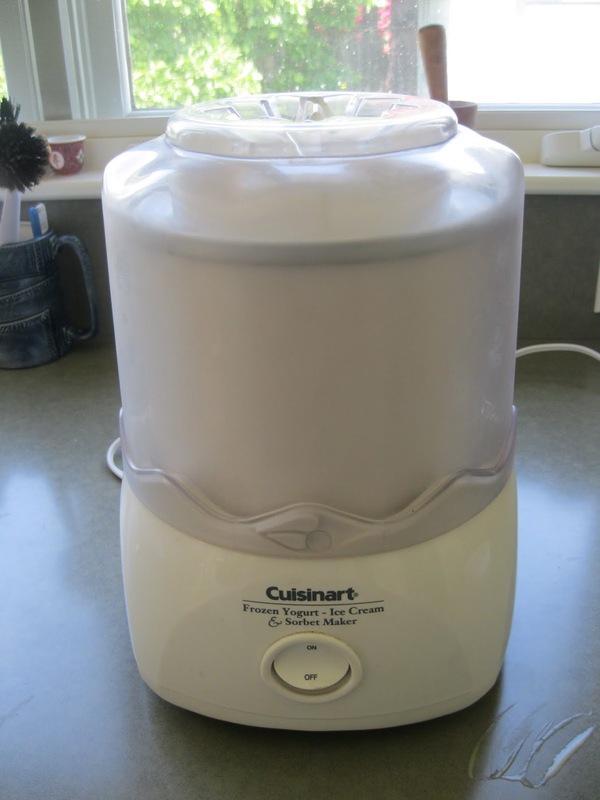 The recipe presumes that you have use of a reliable ice cream maker. With a sharp paring knife slice the vanilla bean lengthwise to split it open and put the two halves on a piece of parchment paper. With the back of the knife, pull down each opened side to scrape out the beans. Put aside for a moment. In a medium pot, add the cream, half (1/2 cup) of the sugar, and the salt and mix over a medium heat until combined. Curl the parchment paper and drop the scraped seeds and pods into the pot stirring to mix. Bring to a low boil then remove from heat to steep for 20 minutes. In a large bowl add the 3 egg yolks then the remaining 1/2 cup of sugar. Whisk the sugar and eggs to combine then add the milk and mix completely. When the steeping time for the cream-sugar-vanilla mix in the pot is done, add the egg-sugar-milk mix to the pot and heat it up on medium low, stirring with a wooden spoon the whole time to complete the custard, about 5-15 minutes. Keep stirring as the custard thickens. After about 5 minutes you'll want to start checking the consistency of the custard. This is how to tell: pick up the wooden spoon from the pot and look at the custard left on the back of it. If you rub your finger across the back and it leaves a space that doesn't quickly fill in, then the custard is done. If it fills in, continue stirring until you check again in a minute or so. Once the custard is done, remove the pot from the heat and pour the contents into a bowl or pyrex container to cool to room temperature, removing the pods and optionally straining the mixture to remove the vanilla seeds. I remove the pods but don't strain the seeds at all as I prefer keeping them in the finished ice cream. I use a 4 cup pyrex measuring container as the custard will just fill it to the top. Once it cools, cover and put it in the frig to completely cool overnight. The next day remove the custard from the frig and pour it into a prepared ice cream maker following the manufacturer's directions to complete the freeze. I find that even once the ice cream has come together I need to put it into the freezer for another couple of hours to completely freeze for serving.